Curvy quilting softens the edges of the pieced flowers and leaves, fooling the eye into seeing them as curved rather than straight. Button-centered appliquéd flowers and an inner border of hourglass blocks give this quilt charm. Transform the forget-me-nots of Summertime Blues into tropical blooms with bold fabrics. A black tone-on-tone background provides subtle movement, yet doesn’t compete with the piecing or appliqué. It’s not always easy to find a quilt pattern that suits your guy’s simple style. Here’s a not-too-fussy way to show him you care. Swing into summer with a light and airy version of My Guy. 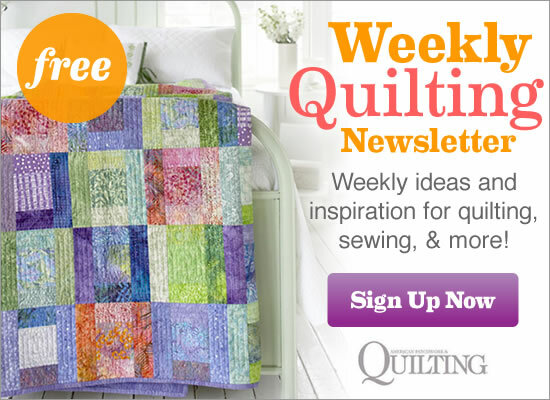 The light setting rectangles and border are perfect areas to showcase quilting designs. Remake a three-color 1940s quilt in your own patriotic prints or solids. Likely made for a member of the armed forces, the vintage quilt features hand quilting in a nautical anchor pattern. To radically change the look of Anchors Away, quilt tester Laura Boehnke used romantic florals, stripes, and prints. “Stripes always make a nice frame and the roses in the outer border add a feminine flair,” Laura says. Fabric bits and pieces are everywhere in this quilt, including the sashing, borders, and binding. You’ll love digging into your stash to come up with just the right mixture. The sashing may look complicated, but actually is simple—just combine fabric strips, then trim to fit. Quilt tester Laura Boehnke’s light and bright version of Pick & Choose showcases the Midwest Modern 2 collection by Amy Butler for Westminster. If you have darker colors in your stash, gather your friends for a fabric swap. By trading bits and pieces, you’ll expand your stash without adding large pieces in colors you don’t often use. If you have an overflowing scrap basket, here’s the perfect quilt to put those bits to use. Strip piecing makes it easy to assemble these blocks of tiny squares. By using deliberate color placement, quilt tester Laura Boehnke brought out the romance in her one-block version of Checkerboard Charm. She first drew the heart on graph paper, then surrounded it with radiating squares for a Trip Around the World effect. Miter the corners of a scalloped border print, create a handful of Sawtooth Stars, and you’ll enjoy a quilted version of a cheerful vintage tablecloth. Quilt tester Laura Boehnke worked from the outside in on her bright kid’s quilt version of Americana Rose, using a vivid stripe as the starting point for choosing colors and fabrics. The result is an evening sky of bright stars. Click here for instructions needed to make this crib quilt. At first glance this quilt looks more time-consuming than it actually is. What saves you time? The appliqué foundations aren’t really pieced. Instead the designers used a “cheater” checkerboard print, needle-turning the floral motifs on top. Quilt tester Laura Boehnke beautifully framed just one block in her table-topper version of Faux Finish. To mimic the look of hand appliqué in less time, she fused pieces in place, then machine-stitched around each piece with matching thread and a tiny zigzag. Mix and match 1930s prints in classic Jacob’s Ladder blocks, then turn them about to create secondary 16-Patch designs. For her version of Mix It Up, quilt tester Laura Boehnke began with a monochromatic palette of browns from the Serenity collection by Daiwabo for Maywood Studio. Adding cool blue gave the table runner a serene feeling. Scraps of antique fabrics sparkle in a miniature star quilt. Re-create the petite table topper with reproduction prints. Quilt tester Laura Boehnke made a dramatic three-color version of A Little Starstruck. “I played with scale a bit by including both small and medium prints,” Laura says.